Abbas said (to Ali): O commander of faithful, O Abul Hasan, I make a hint to you in the day the soul of messenger of Allah departed, to stretch your hand, and we would pledge (allegiance) to you. Even if this matter was already for you, but you disobeyed me, till it was pledged to Abu Bakr. So, why person who was appointed by messenger of Allah (sallalahu alaihi wa ala alihi wa sallam) refused people to pledge allegiance to him? 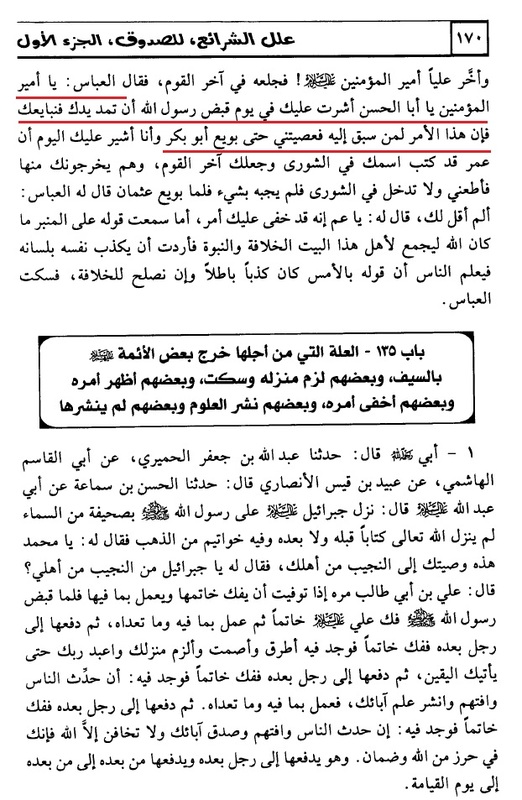 This entry was posted in Defence of Sunnah, History, Refuting Shia doubts, Shia lies, Take a few minutes to think on this by Gift2Shias. Bookmark the permalink.